We have been tackling administrative detention from the day aditus foundation was established in 2011, in terms of monitoring the living conditions and the application of the legal and policy regimes, as we ll as advocating for a revision of these regimes to bring them in line with Malta’s international obligations. Until Malta’s 2015 detention policy reform, the risk of arbitrary detention for stateless persons was not only associated with a regime that automatically detained all migrants – including asylum-seekers – found to be entering Malta in an irregular manner, but also emerged from instances of pre-removal detention of failed asylum-seekers where the person’s country of origin could either not be established or confirmed. Our advocacy activities – consisting of a combination of strategic litigation (namely Suso Musa v. Malta), public awareness-raising, capacity-building and technical reports – were successful largely thanks to the concerted efforts by a group of NGOs that relentlessly urged Malta to revise its reception regime. Whilst the former practice was largely reduced following the mentioned reform, stateless persons remain at risk of arbitrary detention since their statelessness is not a juridically relevant factor in the assessment as to whether detention may and ought to be imposed in pre-removal scenarios. These issues were examined in depth in our 2015 report for ENS, Protecting Stateless Persons from Arbitrary Detention, wherein we underlined how the absence of a statelessness determination procedure exposes stateless people to a legal limbo status impinging on their quality of life and enjoyment of fundamental rights. Our partnership with ENS extended to the recently-published Statelessness Index. Its development increased our awareness of national issues, allowing us to be more strategic and relevant in the way we formulate our advocacy objectives. Malta has neither signed nor ratified any of the two international statelessness conventions, resulting in a national context that does not recognise, identify or grant rights to stateless persons. Whilst UNHCR and our own research does not indicate a sizeable community of stateless people, we are nonetheless concerned that they struggle to be squeezed in legislation and policies that are not targeted to regulating their specific situation, or to meeting their particular needs. A national status, Temporary Humanitarian Protection New, has been created to acknowledge the integration efforts of undocumented migrants (including stateless persons, where relevant) by offering, inter alia, access to the labour market, health services and protection from removal, yet – to date – it remains unregulated and quite discretionary. Overall, Malta provides very limited protection for stateless people. As mentioned, although it is party to some relevant international and regional human rights treaties, it is not party to any of the core statelessness conventions. Maltese law provides some protections against arbitrary detention, but rights afforded to people detained for removal purposes, for example, are very limited. Malta has no mechanism to identify and determine statelessness, and no stateless protection status. 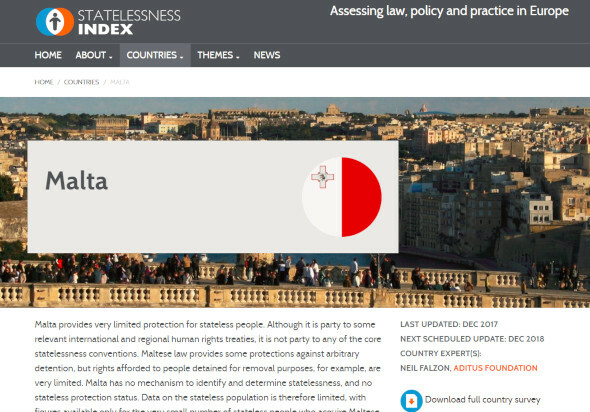 Data on the stateless population is therefore limited, with figures available only for the very small number of stateless people who acquire Maltese citizenship and refused asylum-seekers recorded as ‘nationality not known’ who cannot be returned and may or may not be stateless. There are some safeguards in Maltese law to prevent statelessness, but implementation is problematic and there are some key gaps. The law prevents statelessness in cases of adopted children and new-born foundlings whose parents remain unidentified. 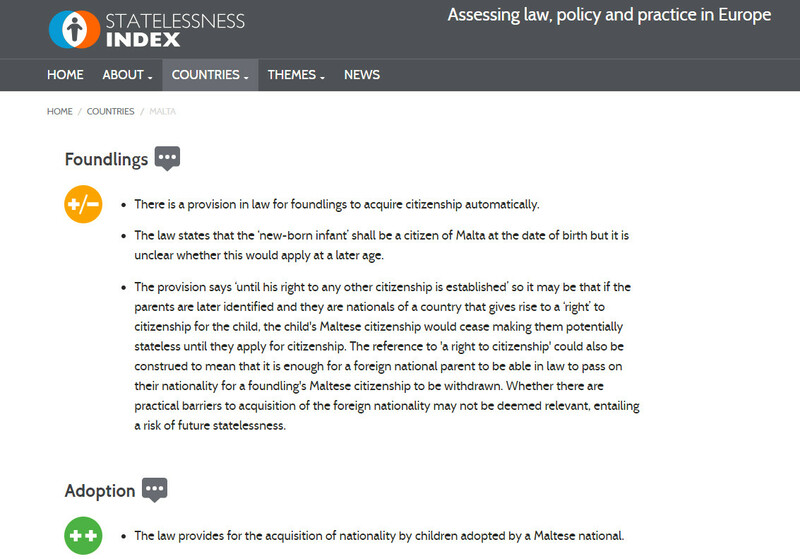 There is a provision granting children born stateless on the territory a conditional right to acquire nationality following five years’ legal residence, but, although in line with the 1961 Convention, the provision does not prevent statelessness in all cases and is not currently implemented in practice. Malta is also yet to amend its legislation following a European Court of Human Rights judgement, which ruled that Citizenship Act provisions distinguishing between children born in and out of wedlock to Maltese nationals abroad, were discriminatory. Our current advocacy efforts are focusing on urging the ratification of the 1954 Convention Relating to the Status of Stateless Persons, as this will provide a basis for establishing a statelessness determination procedure and for gathering national population data that is inclusive of stateless persons. Simultaneously, but at a later stage, we are keen to discuss operational details with the relevant authorities in order to ensure a procedure incorporating best practices, and a status that allows stateless persons to enjoy their fundamental human rights.